This intuitive, powerful and DJ-friendly interface packs dynamic performance features that give you the tools you need to improvise unique sounds and phrases on the fly. Let your creativity take over with the DJS-1000; shape your own sound and reimagine what it means to be a DJ. Make your next set your own. Many of today’s professional DJs use electronic instruments and production gear in their live sets to help make their performances creative and unique. With an easy-to-use interface, 16 multicolored step input keys, 16 multicolored Performance Pads, a host of inputs and outputs, plus various other performance features, the DJS-1000 is the ideal musical instrument to take into the booth and propel your sets to the next level. Add the DJS-1000 to your DJ setup and you can intuitively create unique sounds and phrases in advance of your set, or on the fly, then sequence and loop them as you wish. Improvise a new groove by syncing and mixing with tracks playing on other equipment such as CDJs using the Beat Sync1, tempo slider and nudge features. At a glance, the 7 in. full-color touch screen gives you all the information you need to perform, thanks to easily recognizable sequence patterns and instrument icons assigned to the Performance Pads. 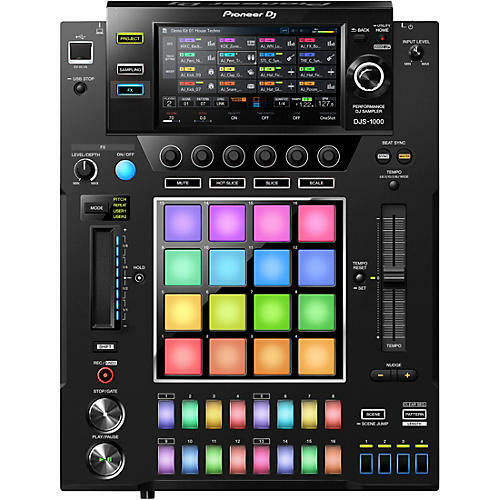 Other features installed on the DJS-1000 include Live Sampling, which enables you to easily sample input sounds and immediately use them as independent tracks or as FX to add to your mix. One year warranty. Warranty terms vary. Check with manufacturer for specific product warranty.